Discussion in 'nVidia Flavor' started by MTonyM, Feb 11, 2019. I have been a long time lurker but now needed to reach out for your expert assistance. 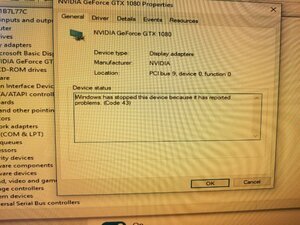 I recently purchased a used GTX 1080 that I was assured works, and so far am unable to get it to work. Here are the details and the behaviours. 600 w OCZ power supply. I have used this system since Ryzen came out with an R9 290 and recently decided to upgrade. When I put the card into the system and boot, the fans and lights all come on as normal. The LED indicator on the bottom right of the motherboard does not signal any errors with the VGA, RAM, CPU or BOOT. When the boot light goes dark, it tells me that the computer has made it into windows. I can also tell because the fans will ramp up and slow down. While this is happening, I do not have an image on my monitor. Through the post, I do not see bios options or the Gigabyte Aorus Logo. When the computer gets into Windows (as seen from the boot light going dark), then the screen changes from "no signal" to "resolution is 640x480/60hz" the standard you are not at native rez line. The problem is that even while this resolution message is on, I am only seeing an illuminated dark screen. I have tried Clearing the CMOS. I have reseated the video card several times. I have tried using a different 8 pin power connector and modular slot on my 600w PSU. By putting an older ATI 5750 into the primary PCI-E slot, I was able to boot into windows with the GTX 1080 in a lower PCI-E slot. 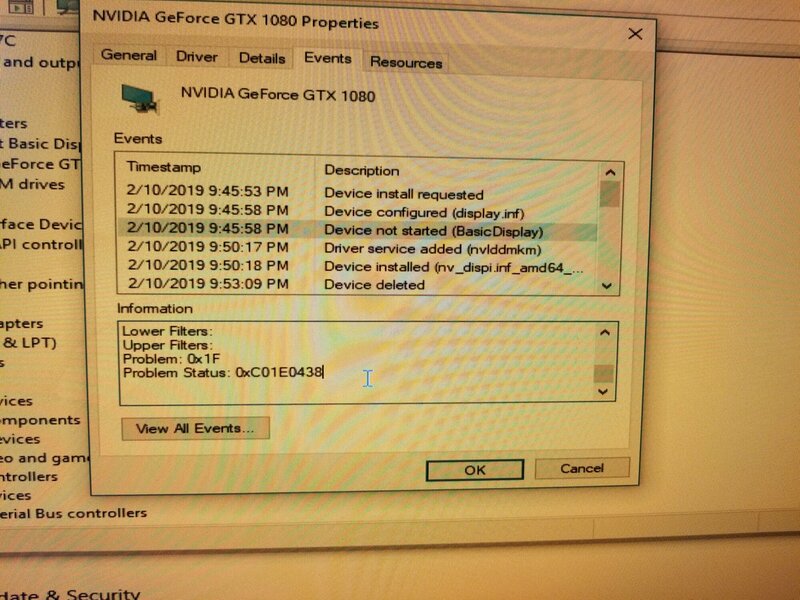 In Device manager, Windows recognized the card as a 1080 and I was even able to install geforce drivers. 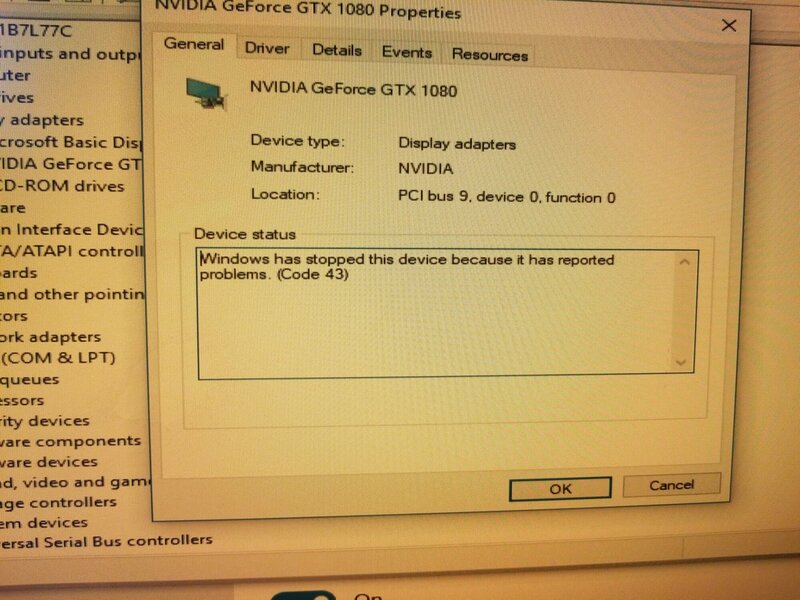 When the computer restarted going back into device manager the message was that "Windows has stopped this device because it has reported problems (Code 43)." I am thinking next step I take it apart to look for obvious signs of damage (caps or thermal paste problems) and then maybe try to reflash the bios. Has anyone ever had anything like this before? The seller assures me that the card works, but I have very little recourse at this point if it does not. Thanks for any and all help you can provide. As a side note, when I reinstall the R9 290, everything works as it used to (minus the cleared CMOS settings). It seems like an issue with the video card. I'd be sending it back. Yeah, I will try, but since it was a cash meet up arrangement, I am at the seller's mercy. If they sold a bricked card, I doubt they are morally upstanding unfortunately. 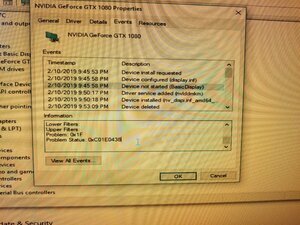 Does the computer usually boot into windows when a GPU is broken? I had assumed it would stop at post but have never dealt with a GPU that didn't display any output. Usually its driver issues or heat/power related corruptions. Why would you buy it if haven't tested it? Since we met halfway, testing wasn't possible. I took a chance, maybe got burned. I'm just trying to figure out if anyone else has experienced something like this before. At a glance the card looks mint, no burnt electrical smell, the fans all spin up. I'll know more when I open it up. It can boot with broken hardware. 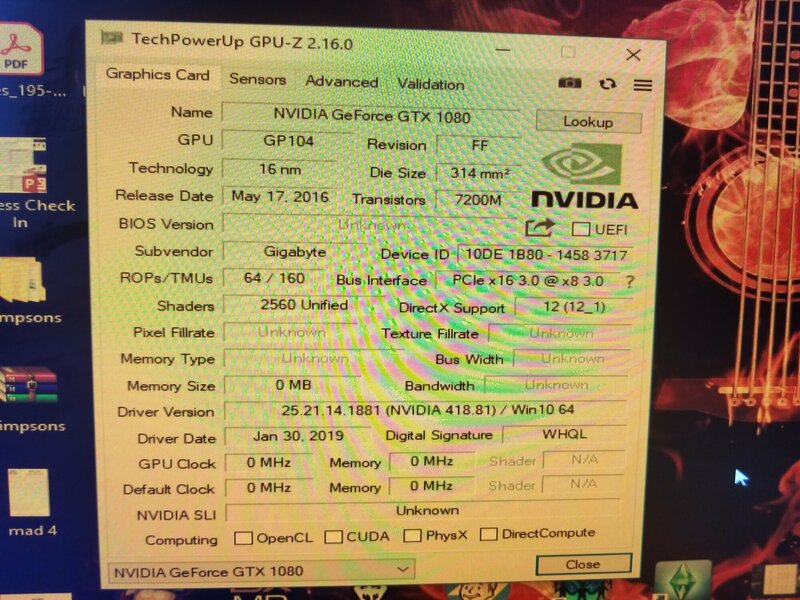 Can you run GPU-Z to see if it detects it and then report back on what it displays (power states, clocks, etc.). Sorry about the res and tint. Its running off 5750 in generic VGA. 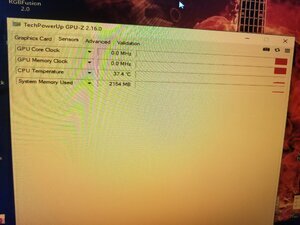 Here are 2 more showing temps and error details. 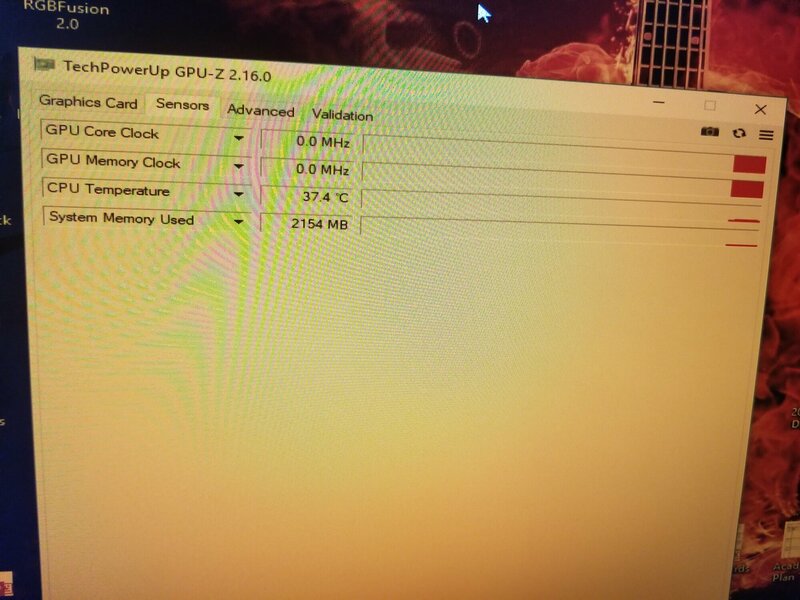 GPU-Z isn’t reporting a bios is that normal if the card is just in and not the primary? Perhaps previous owner fucked up a bios flash? Yeah that was my thinking too, but not sure if its because of the amd video card in primary. I'm trying to work out a refund since he still is adamant it works so I don't want to flash unless that falls through. Are you certain all the required power cables are plugged into the card and board? Have you tried another monitor cable? Need to reseat ram or other components? You can try and find the BIOS for the card to reflash. You want to download nvflash 5.370 at the bottom of the first post. You want the BIOS and nvflash in the same folder. I just put it in a subfolder of my C: drive so it's not hard to get to in the command prompt. I have tried another monitor (using the DVI). It is the same power supply that I used for the R9 290 (8 plus 6 pin) and now only needs the 8 pin. I have reset the CMOS and reseated the Ram. The only thing I have not tried is using the Display ports, because I do not have a DP monitor. Thanks Armenius for the info. I am just waiting to hear back from the seller in case a refund is an option. If not, I will try to flash using your advice. I flashed a newer bios, I could not flash the one suggested as it gave an error missing BB0 placeholders. I can flash the 2 newer bioses on the site, no change, but get errors when trying to flash the older ones. I am going to email gigabyte about an RMA to see if one is possible. And oddly enough the warranty expired in October 2018 even though the card wasn't released until may 2016 and the warranty is 3 years. It says it started in 2015 before the 1080 fe was even released. All in all stuck with a paperweight.